King Herod had John the Baptist executed—even though he liked John—because he wanted to please his dinner guests. Herod was a powerful man but he found himself in a crisis because he had refused to repent as John told him he must do. This shocking story has been the subject of many paintings—we remember seeing two depictions of this grisly scene side by side at the Scottish National Gallery in Edinburgh. Two heads on platters! John was God’s special messenger who called people to repentance, but as it was then repentance is still unpopular. Sam Brewster explained to us that we shouldn’t be surprised or discouraged when people refuse to believe in Jesus. Rejection and gospel growth go hand in hand. He also challenged us to think: Who are the dinner guests in my life that I want to please? This Sunday, Will Stileman will be preaching on the last verses of Mark 6. We hope that you can join us for a time of learning together and encouragement. If you haven’t yet sent us an RSVP, we would love to know if you can join us for a social at Eton’s Prince George pub on Saturday, 15 March at 7:30 pm. Desperation drove a father to Jesus. His 12-year-old daughter was deathly ill. Now, his education, grand career and reputation meant nothing to him. His little girl needed a miracle and thankfully Jesus agreed to come. However, on the way to his house they were delayed. Another desperately ill person pressed through the throngs trusting that if she could only just touch Jesus’ clothing she would be healed. She was. But Jesus wanted to speak to her and acknowledge her faith so that by the time they reached the man’s house the mourners had gathered and were wailing. Jesus spoke to the child and she got up. As simply as you or I would gently waken a sleeping person, so Jesus brought this dead girl back to life. The extraordinary events of Mark 5 show that nothing is so broken that Jesus can’t fix it. You can trust him with your life and you can trust him with your death. And when his timing is completely out of line with yours—trust him. We wish Sam Allberry a fabulous three-month sabbatical. He will be travelling, teaching, reading and having a go at learning Hebrew! This Sunday we welcome back Sam Brewster as he continues our series in Mark. If you will be able to join us for our next social on Saturday, 14 March at 7:30pm, please RSVP to hello@windsorfellowship.com so that we can get an idea of numbers. Our current plan is to meet at the Prince George pub in Eton but we need to make sure that our numbers fit the room. “Clothed and in his right mind.” This is how the gospel writer described a man whose life was mercifully transformed by Jesus. We can only try to imagine the level of lunacy this man must have endured as he lived in the tombs on a hillside. Plagued by thousands of impure spirits, he could not be bound with chains and had been banished from society. Sam Allberry admitted that much in this passage is unclear, but that Jesus’ concern and care for this uncontrollable human is the main point here. As Jesus valued this most unlovable of men, so we too should look beyond outward appearances and seek the best for all we meet. Nobody is beyond God’s reach. 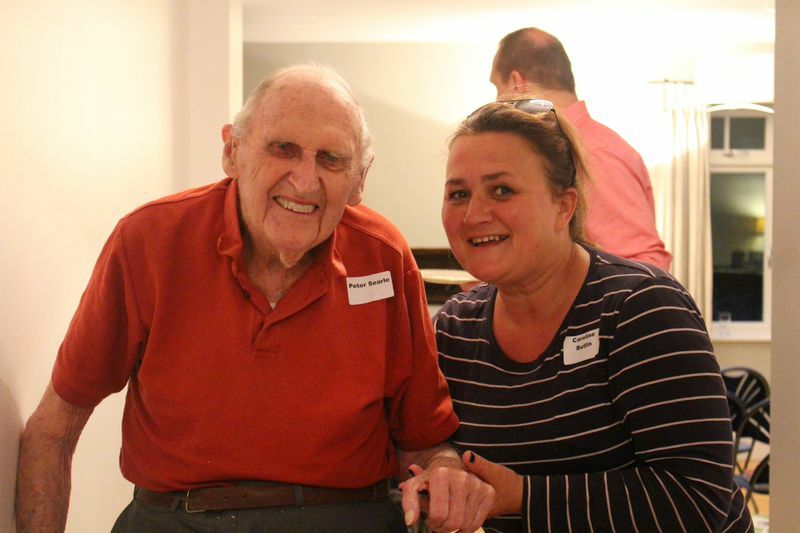 We had a lovely time celebrating Peter Searle’s 95 birthday! It was an honour to hear about his devotion to God. Next Sunday at Windsor Fellowship church we invite all the children and teens to stay on for a games session after the service. And a reminder that our next social will be held on Saturday, 14 March at 7:30pm at the Prince George pub in Eton. 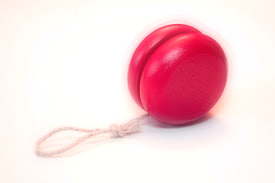 The yo-yo of life—this was an interesting concept explained last Sunday. Sam Brewster at our Windsor church talked about how people often live in fear of the next jolt that life is bound to send their way. Life can be seen as a series of ups and downs and sometimes we feel that it is spinning out of control. Mark 4 tells us about a mega storm, a mega calm, and mega fear. We can probably all look back at our lives and think of times when our circumstances were utterly overwhelming. Anxiety, despondency, and hopelessness stalk us. But when we realise that God is fully in control of all things, we experience calm and peace that is truly supernatural. This Sunday we will have a special 95th birthday celebration for the lovely Rev Peter Searle. We hope you can join us. Last Sunday we learned about a Samaritan woman whose life was radically changed after meeting Jesus. Sam pointed out that Jesus’ disciples had a hard time seeing the “harvest” that was all around them, but in this story it is apparent that many people were ready to accept Jesus as the Messiah. We, too, were encouraged to reach out to people with Jesus’ message of forgiveness and hope. The “harvest” is ripe in Windsor too. This Sunday, the curate from St Mary’s Maidenhead, Sam Brewster, will be coming to preach at the Windsor church for the first time. We look forward to hearing from him as he continues our series in Mark (Mark 4:35-41 if you want to read ahead!). On Sunday, 8 February, we will be celebrating the Rev Peter Searle’s 95th birthday! Come along and hear about the amazing ways that God used him in North Africa during WWII and then as a vicar here in England for many decades. Peter continues to be an inspiration. A date for the diary is Saturday, 14 March when we will have the next Windsor church social. Plans are to have this at a pub in Eton. Details will be finalised soon. Sunday, 15 February will be Sam Allberry’s last Sunday with us before he goes on sabbatical until the end of May. We will miss him but we trust that his time travelling, teaching and resting will strengthen and renew him. In his absence, Will Stileman and Sam Brewster will do the bulk of the preaching for the next three months, with guest appearances from Peter Nevins from Christ Church Virginia Water and Jeff Wattley from St John’s Egham. P.S. If you would like to join a Home Group but haven’t, please let us know! Jesus’ teachings can often be ambiguous. Parables seem strange. Reading the gospels can leave us scratching our heads as we try to dig out the deeper truths. Last week, Sam spoke to us about seeds—in particular the parable of the mustard seed in Mark 4. Only God can make seeds grow, and thus it is with eternal life. Only God can draw people to Himself and He often uses Bible teaching to plant “seeds” in hearts and minds. When the seed finds good soil, it can grow into something marvellous. Sam told us an amazing story about a man from China who learned about Jesus from watching the Simpsons! Even when people mock Christianity, God can use that seed to build faith. Come along on Sunday and hear more of Jesus’ great teaching. No matter where we are on our faith journey, there is so much more growing to do. It’s January—a time for new things—and we have some exciting news about the home groups that are beginning this month. For several decades now, lots of churches have found that by putting people into smaller groups that meet in homes on a regular basis, good things happen. People have a chance to really connect with a group of folks and make new friends. These friends care for them and support them along life’s journey and together their faith deepens as they wrestle with both the good and the bad that life inevitably throws their way. We think that home groups are fantastic and we are really pleased that so many of you have indicated to us that you would like to join one of these groups. If we’ve mistakenly missed you out and you would like to be in a home group, please let us know. It’s not too late to sign up. We will be contacting each home group participant over the next couple of days to let you know which group you will be in. Again, please do get in touch if you don’t hear from us or if you have any questions. The new groups will meet up for the first time next week and will follow a fortnightly pattern during term time. We will be starting with a study of the book of Philippians. Philippians is a short, practical and encouraging book in the New Testament. Group participants will vary in their knowledge of the Bible—some might have studied the Bible quite a lot and some never before—but we welcome that variety because we can all help each other learn. On Sunday, Sam spoke to us from Acts 2:42-47 and challenged us to be a church that learns together and partners together. Home groups will help us to do that. We look forward to all that God has for us in 2015! He wants to pour out His grace on us. How amazing. PS We also have a ladies’ group that meets on a Wednesday morning and we’d be happy to have more ladies come along so let us know if you are interested. This article was originally published in St John’s Egham’s ‘Transform’ Magazine, Issue 32 (May – June 2014). In the New Testament, the word “church” (ekklesia in Greek) refers to the gathering of God’s people in a particular location. So ekklesia is what’s happening in Windsor! People who live in or near Windsor, from various congregations, including St John’s, Egham, St Mary’s, Maidenhead and Christ Church Virginia Water, are meeting once a month on a Friday evening as the “Windsor Fellowship” for a worship service and social time afterwards. The emerging objectives of the Windsor Fellowship are to: 1. Worship God, 2. Build community, and 3. Have a meaningful outreach to seekers and those not currently attending a local church. All of the churches represented at the Windsor Fellowship have excellent ministries which have blessed us and prompted us to think of bringing that same blessing to the community where we live. We have become more and more convinced that if we could get believers in Windsor, Eton, Datchet and Old Windsor together in an evangelical Anglican fellowship, we would have a vibrant, relevant ministry that could positively impact our community with the love of Christ. Since our first meeting at the end of February, we have drawn 75 people (including 16 children) from the Windsor area. We are very excited about what God might have in store for our Windsor Fellowship. We don’t know whether it is leading to a new church in Windsor or something else, but we would ask you to join us in prayer that God will guide and direct us. Jeff Wattley will be speaking at the next Windsor Fellowship meeting on Friday, 30th May, at 7:30pm, at the home of Curt and Janice Hopkins, Beech House, Hermitage Lane, Windsor, SL4 4AZ. Meetings planned for the summer are on 27 June, 18 July, and 29 August (also at the Hopkins’). All are welcome! If you plan to come to one of our meetings or if you would like further information please email Norm Beers (normbeers@gmail.com) or Susan Beers(susanbschaeffer@gmail.com).